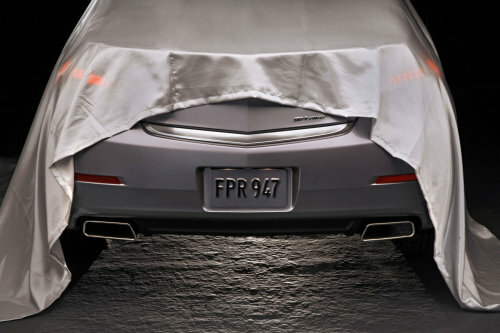 The 2012 Acura TL sedan is scheduled to make its grand debut tomorrow at the media opening of the 2011 Chicago Auto Show but today, the luxury brand of Honda teased the back end of the new TL. As you can see in the image on the left, Acura has lifted the sheet just enough to show off the revised back end, featuring a new lower fascia area with the license plate now inserted higher than the 2011 TL sedan and the large lower fascia area (which previously held the license plate) has been removed, giving the car a much smoother look across the back end. Along with the redesigned plate location, the angular lower reflectors have been narrowed for more of a linear look and the pair of split-style tips have been removed in favor of a larger, single opening tips. Overall, the change to the rear end of the 2012 Acura TL might not even be enough for the average consumer to notice but the real point of interest is the front end. The distinct, angular front end that is featured across the luxury brand’s lineup has not been as popular as the company had hoped so there are rumors that we might see something a little less robotic looking when they unveil the entire car tomorrow in Chicago. We may also see slight revisions in power and/or fuel economy from the 3.5L and 3.7L V6 engines, as Acura works to keep up with the Jones’ in a very tight luxury sedan class. With companies like Lincoln and Cadillac making such substantial improvements over the past few years, Japanese luxury brands like Acura are forced to continuously adapt to keep up with the industry. TorqueNews.com will be at the 2011 Chicago Auto Show so check back for all of your breaking auto show news from the Windy City!